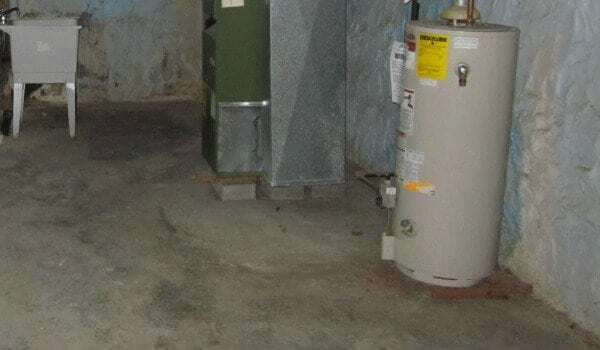 Do you avoid visiting the dark realm of your unfinished basement because of musty, unpleasant smells? Do you keep your family from descending the basement stairs for fear that the dirt and germs will cling to their feet and legs? You can reclaim your basement area by choosing from and using a few inexpensive cleaning tools. First, let’s get rid of the smells and the germs that cause them. Mildew and microorganisms can thrive in your basement and make it smell like a swamp! The most important thing to do is open your windows and even use fans to circulate the stagnant air. To get rid of the mildew, mix a couple ounces of bleach with a quart of water, putting it in a spray bottle. Spray the floor (and even the walls) with the solution and scrub with a bristled brush that is made of nylon, not metal. You don’t want tiny pieces of metal getting stuck in the concrete. Then you’ll have rust to get rid of! Something you might find easier to use is bleaching powder. You can find this in the grocery store near the laundry detergent. Sprinkle the bleaching powder all over the basement floor. Let it sit for at least 24 hours. The powder will absorb the odors and what causes them before you sweep or vacuum it up! Some people don’t like using ammonia because of the strong smell, but it will usually get rid of dirt and grease that other solutions won’t. Pour a quarter cup into a bucket of water and use your nylon-bristled brush to scrub the basement floor with it. Rinse when done, and use a wet/dry vacuum to pick up excess water. Whatever you do, don’t ever mix bleach and ammonia. A combination of these two things makes a dangerous chemical reaction that you don’t want to be near! Now that you have the floors (and hopefully the walls) clean, and the basement smells less like a murky dungeon, you want to keep it that way! Be sure that the area is well ventilated by opening the windows on warm, dry days. A dehumidifier can be very useful in helping regulate the moisture in the air. If your smell returns and you just can’t find a way to get rid of it, seal the clean concrete floor with a concrete sealer. If you think this sounds like a lot of work, you’re probably right! There are companies you can hire to disinfect and clean your entire basement area. Most of them even provide water removal, sealant options, and dehumidifiers. Whether you choose to tackle cleaning the basement floor yourself or you hire someone to do it for you, there’s no reason to fear this room anymore. By taking this step, you will add a new usable area to your home!